Swissquote launches Apple Watch trading app as they expand their mobile offering from smartphones and tablets to include watches. Swissquote has become the latest broker to embrace the future of trading and wearable technology with the launch of a platform app for the Apple Watch. 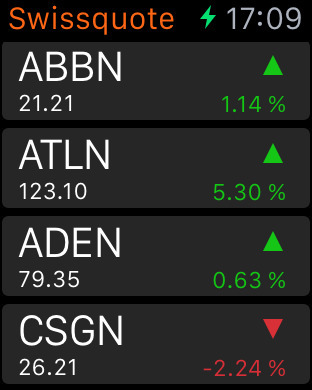 Working in tandem with Swissquote’s iOS mobile app for iPhone devices, the Apple Watch version provides an extended screen for quick glance at quotes, charts and account balances. The app launch expands Swissquote’s line of mobile platforms which include products for iOS, Windows and Android smartphone and tablet devices. Like other apps made for the Apple Watch but are connected to their iPhone equivalent, the new Swissquote platform will provide users notifications through subtle vibrations of market and account events. Along with health monitoring uses, feedback from users has shown that wrist-based notification is the most important feature as it saves users time in keeping up to date with real-time events. Whether an Apple Watch becomes a popular choice of trading remains to be seen. The question was raised at the end of the iFX Expo’s Business Trends panel. Panelists were asked whether the strong trends of mobile trading, of which some brokers were experiencing over 30% of their volumes originating from smartphones and tablets (at Swissquote the figure is 15%) would mean success for Apple Watch trading. As seen below in this video clip, answers were varied, with many in the finance and technology industry believing that we are only beginning to understand how wearables will be best used by consumers.